“Wanna see a puffin chick?” Peter asked me, smiling. Peter Hodum, a visiting professor at the University of Puget Sound, was perched on a cliff about 100 dizzying feet above the surging Pacific Ocean. He was unfazed by the height, an adventurous biologist in a blue shirt the color of the sea below. On his head he wore a strange visor that made him look like an out-of-place video-gamer. When I reached him, he put the visor over my eyes and slid a long flexible tube into a burrow in the soft earth. The infrared camera lens on the end of the tube sent a grainy image to a screen in the visor. In the burrow, a puffy chick hunkered against the far wall, a ghostly gray. I could distinctly make out its eyes and a pale dot on its beak, an egg tooth, used to break its shell. He was checking puffin burrows as part of the first multi-year study of the species in Washington State. Arguably the most charismatic and beautiful seabird on the west coast, the puffin is an icon of the Pacific Northwest, a symbol of the wild, rocky shore. Surprisingly, no one knows much about it. “It’s woefully understudied,” Hodum said. He would like to change that. Hodum and Scott Pearson, a research scientist for the Washington Department of Fish and Wildlife, initiated a study in 2005 in response to the feeling among seabird experts that puffins are disappearing in the state and along the west coast in general. The heart of its range (see map) is along the coasts of Alaska and Russia, where its numbers remain strong. But perhaps because of its success in the North Pacific, or perhaps because the Atlantic Puffin receives much more attention, the disappearance of the Tufted Puffin on the west coast has gone largely unnoticed and unexplained. Like Atlantic and Horned Puffins, the Tufted is a sweet-faced clown of the sea. 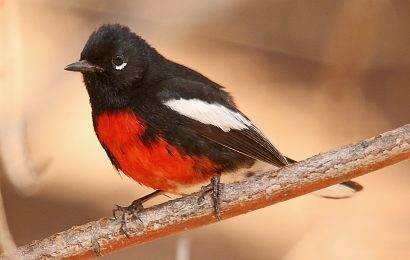 It has a striking white face and massive orange beak, at once comical and irresistible. On land, it shuffles on big bright orange feet, semi-erect and waddling. Unlike its cousins, its plump body is all black, giving it a more demure and mature look. And the distinctive and incomparable tufts on each side of its head are unique in the puffin tribe. Corn-silk yellow, combed backward, they give the bird an endearing touch, like a long-haired, eccentric professor. One look and you’ll fall in love. As I see it, his attention to the puffin is significant because he could easily have said, “I’m too busy.” In addition to teaching college students about ecology and conservation biology, he also leads a research and conservation project on the Juan Fernández Islands, 400 miles off the coast of Chile, where two bird species are listed as Critically Endangered and four are listed as Vulnerable. 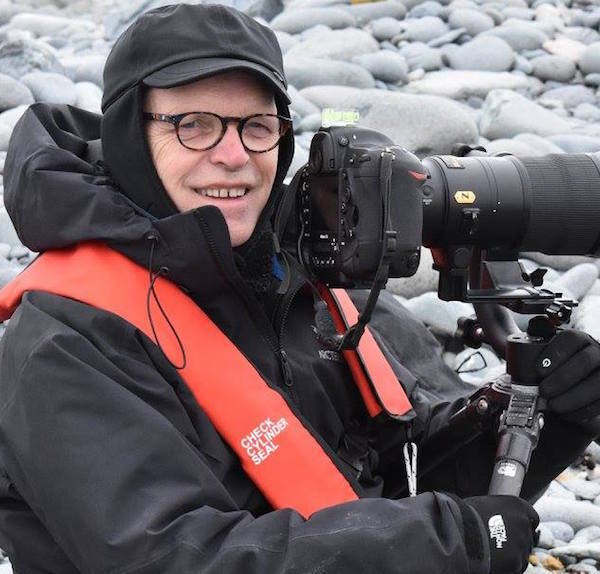 He is also a project leader and board member of Oikonos, a nonprofit organization that directs conservation projects in California, the North Pacific, Chile, New Zealand, Mexico, and Antarctica. But he makes time for puffins. Rugged, remote, and raucous with seabirds, Tatoosh Island is one of the great wild places on the west coast. Located on the extreme northwestern tip of the continental United States, it’s separated from the Olympic Peninsula by half a mile of treacherous ocean currents and fierce tidal rips. Its tall rocky cliffs and flat top give it the look of a fortress, and in fact, it is one of the last strongholds for puffins in Washington and the west coast. That’s why Hodum is here — that and the fact that the Makah Tribe owns the island. The Makah protect it as a sanctuary for marine wildlife and give scientists access for research. When I spent a day with him recently, Hodum was monitoring 17 burrows on the southern end of Tatoosh. Several of them took him quite literally over the edge of the cliffs. The work is not for the faint of heart, especially when Glaucous-winged Gulls begin dive-bombing. But the scenery is unforgettable. Behind us to the south, the sea stacks off Cape Alava presented a stunning view of the wild coast, rising from the ocean like a row of dragon’s teeth. 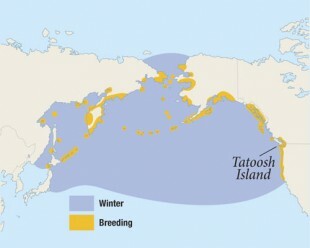 Long-term seabird studies on Tatoosh began when Julia Parrish, a professor of ocean and fishery sciences at the University of Washington, launched a survey of Common Murres in 1990. When Hodum and Pearson began their study in 2005, with collaboration from Parrish, they found only five successful active puffin burrows. 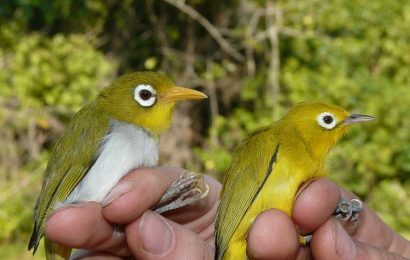 In subsequent years, they have had as many as 14 successful breeding pairs in the study area and an estimated 20 to 25 pairs on the entire island. In the 1970s, biologists working on the island estimated that 150 to 200 puffin pairs nested here. The decline has been mirrored throughout the state. Hodum and Pearson visited 34 locations where the birds were known to breed. They once even nested in busy Puget Sound. But no more. “Nearly half the colonies have blinked out,” Hodum said. And not just in Washington. “In Oregon, the Tufted Puffin has collapsed,” Roy Lowe told me. He’s the manager of the Oregon Coast National Wildlife Refuge Complex, a group of six coastline refuges. Surveys in 1988, he said, estimated about 5,000 puffins in the state. A 2008 survey found just 148. 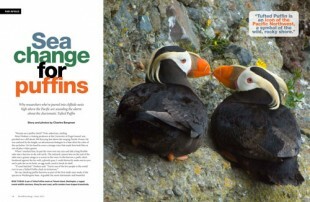 In California, Tufted Puffins once numbered in the thousands, nesting as far south as the Channel Islands. Now, 80 remnant pairs hang on in the Farallon Islands west of San Francisco, their southern limit. When Hodum finished checking his burrows, we sat on the cliffs at the southern end of the island. Several puffins were flying past us, circling along the cliff face. Many carried forage fish in their beaks for their young. With their chunky bodies and undersized wings, they churned past us in heavy, labored flight. We talked about the future of Tufted Puffins in the lower United States. On steep, rocky islands and mainland cliffs from California to Alaska to Japan. Largest colonies are on the Aleutian Islands. Nests in burrows that are about three feet long. Offshore throughout the North Pacific. Small schooling fishes, including anchovy, capelin, and lanternfish, krill, squid, and bristleworms. Later we went to the only beach on the island, in a small cove on the north end. He was meeting Pearson so they could survey offshore rocks and islands by boat. Pigeon Guillemots swam on the calm waters. Hodum had kayaked to Tatoosh and left his kayak on the pebbled beach. After helping carry it to the water, I asked him why puffins are in trouble. Possible natural causes of the decline include predation and harassment. Populations of gulls, eagles, and Peregrine Falcons have boomed on the Washington coast. The predators disturb puffins at their burrows and even take adult puffins. More serious, though, is the possibility that the puffins are sending signals about changes in the ocean. Higher sea temperatures caused by global climate change have affected productivity and food availability. Hodum cited a 2003 study on Triangle Island, in British Columbia. Researchers found that puffins there were highly sensitive to variations in surface temperatures of the ocean. In years when ocean temperatures rose, reproductive success fell. 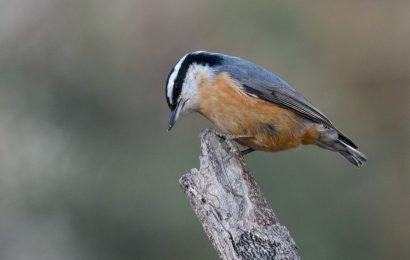 The authors worry that global warming could spell the end of the birds in British Columbia. Scientists suspect that acidic ocean water may be responsible for a 2008 die-off of several billion oyster, clam, and shrimp larvae off Oregon. “There’s no doubt that carbon dioxide levels are going up off Tatoosh,” Hodum said, citing long-term ocean monitoring studies conducted from the island. Other threats to the species, none of which are easy to fix, include oil spills, ingestion of plastic, bycatch in fishing nets, and predation by introduced rats, foxes, and other mammals. In 2009, when I joined him on Tatoosh, the puffins were having a relatively good year. Of the 17 burrows that he checked, all but three were active, with chicks, eggs, or incubating parents. But hatching success has varied a lot from year to year: from 56 to 82 percent of all eggs laid annually. And fledging success in general has been low, exceeding 40 percent in only two years of the study. In contrast, Rhinoceros Auklets on the island have had much better reproductive outcomes over the same period. Of the 2.9 million Tufted Puffins worldwide, 77% breed in Alaska. North America’s three puffins: the Tufted, Atlantic, and Horned. Hodum paddled out of the cove in his kayak, on his way to meet Pearson. If the currents aren’t strong, he told me, he’d circle Tatoosh and count puffins. I had been invited to stay on the island for several more days with researchers studying colonies of Common Murres. At night, we would also capture Leach’s Storm-Petrels in mist nets, and perhaps a Rhinoceros Auklet or two, and band them. Every hour during the days, I counted puffins for Hodum. I sat on a column of rock that juts from the cliffs on the west side of the island. It offers a good angle for studying the sheer cliffs, stained white with murre droppings. I counted puffins on the cliffs, in the water, and in the air. During the afternoons, several puffins rested on a steep rock in the sun. They were probably nonbreeding birds, looking for mates and prospecting for burrows. Other puffins rested on the water, and I could watch them dive. Awkward on land, straining in flight, they are agile and graceful underwater. In the evenings, as the sun set over the ocean, I sat near them as they returned from the sea to their burrows. They circled close to the cliffs, making pass after pass, before landing. Backlit by the sun, their feet glowed orange, and I could see their blood vessels. In the late light of my last evening, a puffin landed close by. Head cocked, it looked at me with pale blue eyes that were circled by a line of bold orange. They struck me as among the most expressive eyes I’ve seen in birds. Two long fish dangled from its beak. It lingered for a moment in the golden light, then scooted into its burrow, just a few feet from me. Puffins are usually quiet, but I realized that I could hear it murmuring to its chick, a low rumbling from the burrow, almost as if the earth itself was speaking.